Sing, Dance, Eat, Celebrate and Give! As the month of Ramzan ends, Muslims world over celebrate Eid by sighting the Shawwal Moon. Shawwal is the tenth month in the Islamic calendar. Eid is a joyous day and celebration of brotherhood. It is a day of Thanksgiving. In India, Pakistan, Nepal and Bangladesh the night before Eid when the crescent is sighted it is called Chand Raat(Night of the Moon). So this year the moon was not sighted on the night of Sept 9th as predicted earlier but instead was sighted on the night of Sept 10th. Therefore Eid is being celebrated today on Sept 11th. The non sighting of the moon postponed my mom’s plan of cooking Biryani(a pilaf of rice, spices, saffron and lamb) till today. When I was in New York where there is no shortage of Indian or Pakistani restaurants I still could not find a decent Biryani so I was definitely looking forward to this meal. 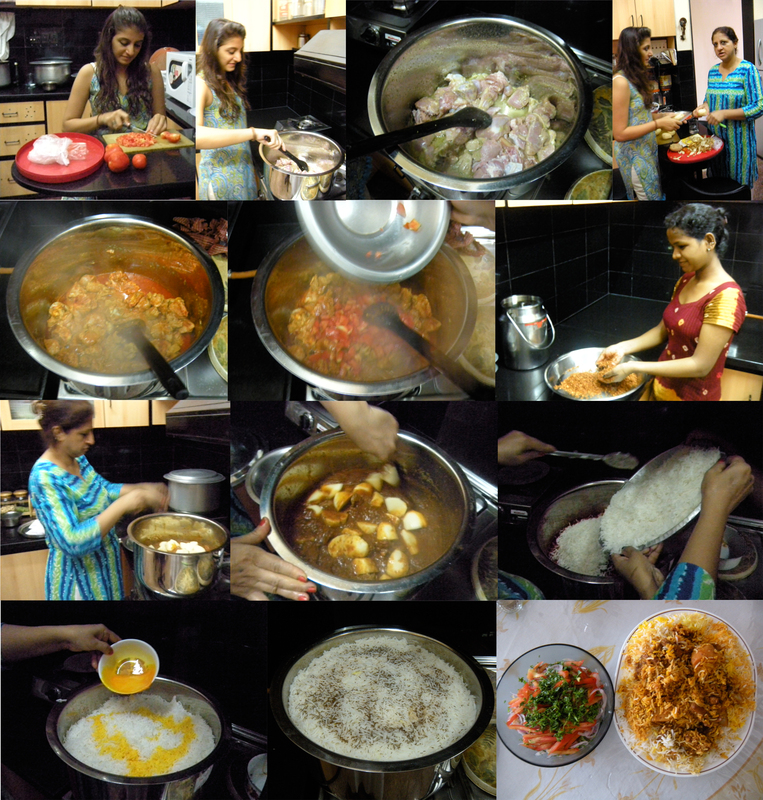 I have documented the process of cooking Biryani for everyone’s delight. Today also happens to be Ganesh Chaturthi also known as Vinayaka Chaturthi believed to be the birthday of Lord Ganesha and the day when devotees welcome him into their houses. The festival lasts for ten days and on the eleventh day (known as Ganesh Visarjan) the Ganesh idols are taken through the streets in a procession while singing and dancing and immersed in the sea symbolizing a sendoff where the Lord begins his journey towards Kailash(Mount Kailash believed to be the heavenly abode of Lord Shiva and Parvati) taking with him the misfortunes. 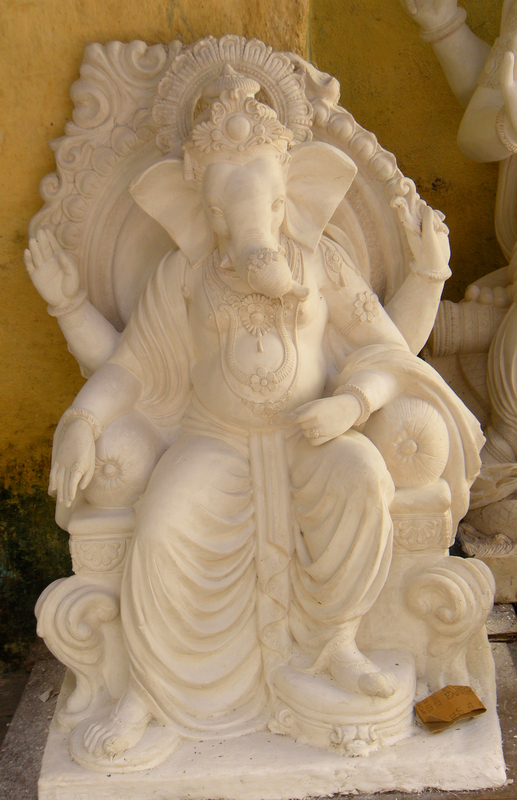 An idol of Lord Ganesha made of plaster of paris being prepared days before Ganesh Chaturti. Ganesh Visarjan and Eid also have a commonality and that is on the day of Eid it is believed that Allah blesses his spiritual children and forgives their sins. The same applies for Ganesh Visarjan, the day the Lord leaves on his journey to Kailash and in the process purifies souls of his worshippers. So I say let’s celebrate this diversity and serve the Biryani and Modak(a sweet made on the occasion of Ganesh Chaturthi and believed to be Lord Ganesha’s favourite sweet containing rice flour, water, oil, grated coconut, jaggery and milk). Eid Mubarak and Ganesh Chaturthi to all! Pakistan has seen the worst floods in recent time and the United Nations estimates that more than 13.8million people have been affected. If you can please contribute to an organization of your choice. Here is a list of few organizations that are at the forefront of rescue, rehabilitation and relief efforts. Contacts: Anas: 04-3373632, 3377678; Inayat Rahman: 050-6317131; Ayub Afridi: 050-4545106;Khayal Zaman Aurakzai: 050-6287655; Ghazi Marjan Aurakzai: 050-6469910; Asam-u-Din Aurakzai: 050-7144992. •	Hillary Clinton announced that Americans could text the word “SWAT” to the number 50555 to donate $10 per SMS message to the UN High Commissioner for Refugees to provide tents, clothing, food, clean water and medicine to Pakistan. This entry was posted in Culture, Food, Travel and tagged art, Bombay, Culture, Festival, Food, Indian, Religion, Travel. Bookmark the permalink.